Preheat the oven to 400°F. Line two 8 X 8 or 9 X 9 square pans with parchment paper. If you only have one square pan you can bake one half of the "intestines" at a time, just remember to allow yourself more time for baking. On a lightly floured surface, unfold both sheets of thawed puff pastry. Cut one of them into thirds using the folds as a guide. you'll be left with 3 long rectangular pieces and one full sheet. Beat the cream cheese, almond extract, and 2 tablespoons of the sugar until fluffy. Spread the cream cheese over each of the 4 pieces of puff pastry, leaving about 1/4-1/2" all the way around. Place the raspberries, 1/4 cup sugar, lemon juice, and cornstarch in a small saucepan and heat over medium, stirring occasionally. The raspberries will cook down a little and the sauce will thicken. This takes about 5 minutes. 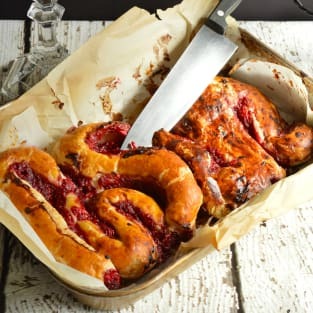 Spoon half of the raspberry mixture over the cream cheese on each piece of pastry and spread it out with a spoon. Take one corner of the largest piece (the whole sheet) of puff pastry and roll it up, like a giant crescent roll. It's okay if the raspberry filling gets on the outside of the pastry (it'll make it more icky-looking as it bakes). Carefully lift the filled pastry and place it seam-side down into one of the prepared pans. Wind it into an intestinal shape. Roll up each of the 3 remaining small pieces by folding up one of the long ends and rolling them jelly roll style. Wind them into the second prepared pan and pinch the ends of each piece together so they form one long "small intestine". You can leave a gap when winding them into the pan; they will bake together when they rise. Beat together the egg + water and brush both pans of pastry all over with the egg wash. Then spoon the remaining raspberry filling into the folds and spaces between the puff pastry pieces. Bake until the tops are a deep golden color. I pulled the smaller pieces out after about 15 minutes and let the larger piece bake a bit longer.